Just like place Bellecour, Saint-Paul station and Fourvière Hill, place des Terreaux is one of the focal points of the Festival of Lights. This year, the square will be undergoing redevelopment as part of the Coeur de Presqu'île urban planning project. Over the years, the paving has suffered wear and tear due to extensive footfall and the water features no longer work. The renovation work will be overseen by the architects who originally designed the square in 1994, Daniel Buren and Christian Drevet, and will begin in the autumn. The aim is to give the square a complete facelift and adapt it for current usage. The place des Terreaux will still feature two-tone granite squares but the paving slabs will all be replaced. Fifteen mini fountains will lead from the City Hall to the Galerie des Terreaux on the opposite side of the square in keeping with the water theme and complementing the Bartholdi fountain, returned to its former glory in 2018 after two years’ renovation. 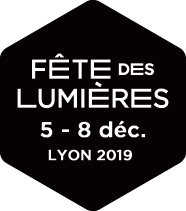 Additional lighting will be provided in the form of wall lights for the Fine Arts Museum and Galerie des Terreaux and lanterns on buildings to the north. This facade lighting, together with the candelabras around the Bartholdi fountains, lights embedded in the paving and the illuminated mini-fountains will contribute to creating a warmer atmosphere while ensuring the area is adequately lit for security reasons. What will happen during the Festival of Lights? The place des Terreaux will feature rope lighting flashing on and off in a symphony of light designed to create a hypnotic effect overhead. Right next to the square, the gardens of the Museum of Fine Arts will house an original installation created in collaboration with the Crédit Mutuel bank in which more than fifty professional and amateur pianists play live around a light feature. The gardens of the Fine Arts Museum are a unique haven of peace in the heart of the modern city; the time old walls of the former abbey cut visitors off from the hustle and bustle outside. In this delightful setting, festival goers will be able to admire an everchanging light show which varies each time according to the melody chosen. ►Watch this space! the festival will be appealing for amateur pianists to sign up to participate in this project! ►Consult the description of the Bartholdi Fountain renovation project on the City of Lyon website (in French).